For those of you who watch the MTV series, ‘Catfish,’ you might be familiar with this scenario. Imagine if you met your dream guy online or on a social media site. You spend hours and hours a day chatting online and through instant messenger, but you haven’t taken your relationship offline? Is he or she stalling or is there someone else behind that photo and computer keyboard? Here are some signs to look out for while dating online. 1. A Catfish is someone who creates a completely different persona online than who they are offline. 2. You may hear his or her voice, but you never have the chance to meet IRL. 3. You believe you’re in a relationship, but you may be in love with the possibilities of a future with him or her. 4. Your date sends photos that look too good to be true; almost too perfect like a stock image photo. 5. You ask your date to set up a video date on SKYPE or Facetime, but they come up with excuses why they can’t. 6. Your date schedules and cancels dates repeatedly with excuses of work, love, or medical problems. If you aren’t sure if your date is for real or not, use Google Image search and upload their profile photo to see if their photo appears anywhere else on the Internet. 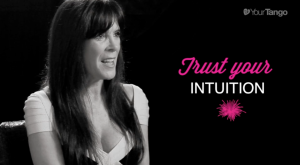 At the end of the digital day, remember to trust your intuition, take your time and make sure you have the opportunity to meet the person in real life if you really want a relationship. Are you dating someone online that you haven’t met offline? Share your story here. Julie Spira is America’s Top Online Dating Expert and Digital Matchmaker. She was an early adopter of the Internet and helps singles select the best dating sites, mobile apps, and creates Irresistible Profiles for singles on the dating scene. For more online dating advice, follow @JulieSpira on Twitter and sign up for the free Weekly Flirt newsletter.